Collins 120" Fiberglass Tape Measure. 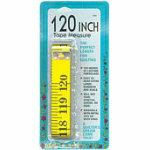 120 Inch fiberglass yellow tape measure. Inch and centimeter scales. Extra-large, easy-to-read numbers. Use to measure quitls for borders and backing. Also excellent for home decorating projects. East to read extra large numbers. Washable, with metal tips on both ends.